Methinks I love Dr. Seuss, thus this snapshot of part of the mural on the perimeter of a parking lot — artist unknown. Theatergoers can take in this public art piece by Mayme Kratz and Mark Ryan called “trueNorth” (2007). Constructed of concrete, resin, stainless steel and fire, it is best viewed up close, where you can notice the bits of paper and other materials secreted away in the fiery resin knobs. “trueNorth,” a City of Tempe public art installation at the Tempe Center for the Arts, facing the Tempe Town Lake. In conjunction with the 2014 Indian Fair & Market, one of Arizona’s best-known street artists, Thomas “Breeze” Marcus, completed a 450-square-foot mural in five days for an exterior wall of the Heard’s Steele Auditorium. Called “The Power of Mother Earth,”the mural is a striking addition, but you need to drive around to the rear parking lot to see it. Detail from the mural “The Power of Mother Earth” by Thomas “Breeze” Marcus. This is the bronze “Zuni Girl,” by Nez Perce/ Assiniboine/Chippewa artist Doug Hyde. Renovations and expansions in recent years have made the Heard lovelier than ever — the huge lawn, the architecture, the attention to showcasing Native American sculpture on the museum’s grounds. For instance, here’s “Khwee-seng (Woman-man),” a bronze by Nora Naranjo-Morse, in the courtyard near the bookstore. “Khwee-seng” by Nora Naranjo-Morse (Tewa). Several sculptures in the courtyard and near the parking area command attention, proving that you don’t need to pay museum admission to see museum-caliber art. I happened to catch this Paolo Soleri sculpture in nice afternoon light. It’s made of Cor-ten steel treated with chlorine and acid and is called “Il Donnone,” Italian for “big woman.” I like the artist’s suggestion that a woman can reach beyond any boundaries. “Il Donnone” by Paolo Soleri, esteemed Arizona artist and architect. Created in 1972. The main desk can provide a brochure outlining the locations of several works of art inside the five-floor library, which in itself is one of the country’s architecturally significant public libraries. 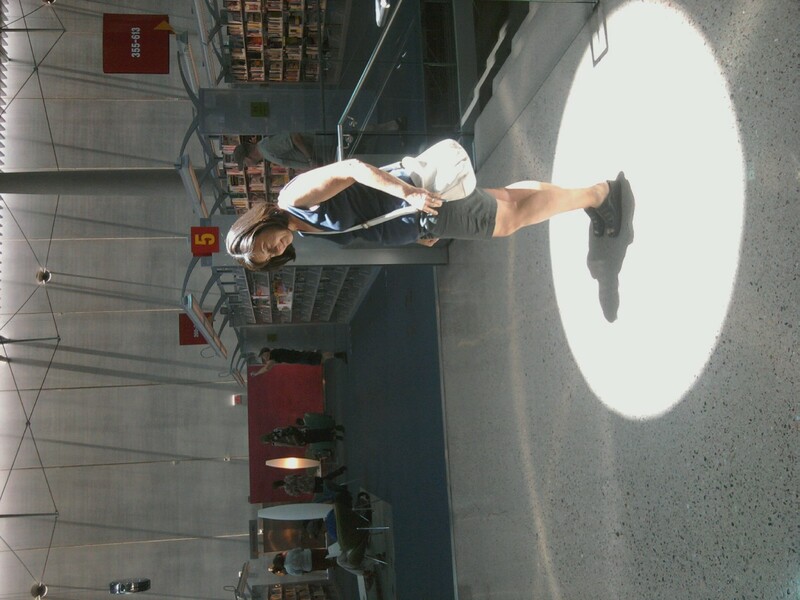 The blogger can’t resist putting herself in the spotlight. My children will be pleased to know there is another woman out there running around with camera in hand. And one who appreciates the finer points of ceilings, at that! My son was not exactly enthused about taking this pic for me when there were lots of people around. But he did. And he loves my Nikon almost as much as I do!